After a day in the sun, we crave foods that have a high acid content, such as lemons and limes (isn't that why margaritas taste so good after a day at the beach!). The barbecued lemon wedges, which are edible, and lemony sauce in this perfect Sunday supper dish satisfy that craving. This recipe is very easy to prepare and assemble. The brochettes can be grilled outdoors on the BBQ or broiled indoors in the oven. 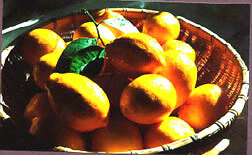 Select 2 small lemons that have thin skins. Wash and cut the ends off, then cut each lemon in half (as though for squeezing). Remove the seeds and the central membrane, then cut each half into 4 equal pieces (altogether 8 pieces per lemon). Gently blanch the lemon wedges in barely simmering water for 10 minutes, until the skin is soft, but still retains its form. Remove with a slotted spoon, reserving the cooking water for the peppers. Pat the wedges dry and coat them with olive oil and 1-2 TBS sugar. Set aside until ready to assemble the brochettes. Seed and core 2 red and/or green bell peppers and cut each one into 1 " squares. In the lemon cooking water, blanch the squares in hot water for 6 minutes to partially cook so in the final grilling they will be completely cooked. Drain and pat dry. Coat with olive oil and sea salt. Set aside until ready to assemble the brochettes. Use 1" thick swordfish steaks (remove any dark flesh). Cut the fish into 1" squares, roughly the same size as the peppers. Season with salt, pepper, 1 TBS olive oil and Herbes de Provence. Soak six 8" bamboo skewers in water for 15 minutes. Assemble each brochette with a lemon wedge at each end and one in the middle, with the skin side facing out. Each skewer should have 4 lemon wedges, 4 peppers and 3 pieces of fish. Grill the brochettes until the fish is cooked and the lemon wedges are slightly browned around the edges. Serve immediately on a bed of basmati rice and napped with a tangy lemon sauce. Whisk together a few TBS each of warm fish stock (or white wine), lemon juice and soft butter. Thin skinned lemons: Most Eureka lemons, those commonly found in supermarkets, have a fairly thick layer of white pulp under the skin. This pulp is not tasty. Try to select lemons that have the least amount of white pulp. We haven't tried this recipe with Meyers lemons. They should work, but the overall effect won't be quite as tangy. Swordfish Steaks: In the U.S., swordfish is probably the most suitable fish for this recipe. Other similar densely-textured fish, which will not fall apart when skewered and grilled, would also be suitable. In France, merou (grouper) would be used. Soaking: This prevents the bamboo skewers from charring and burning during grilling. This step is not necessary if you're using metal skewers. Fish Stock: There is a wonderful powdered fish stock called Fumet de Poisson, which made by Maggi, that makes instant fish stock by just adding water. We buy this product in France. In the U.S., you might find it by mail order at a store in San Francisco called Made in France (415) 487-9698.